Gorippus (wrongly known as “Corippus”) was a mid-6th c. Latin poet from North Africa who wrote a rather lengthy poem celebrating a minor Byzantine general named John. This John was dispatched from Byzantium to quell a Berber revolt (which he managed to do), and this confrontation is the subject of the epic. Gorippus wrote a classic Latin epic following the lead of Vergil, Lucan etc., though he introduces Christian elements and employs an often uncommon language, which was characterized by scholars as tainted with vulgarisms. 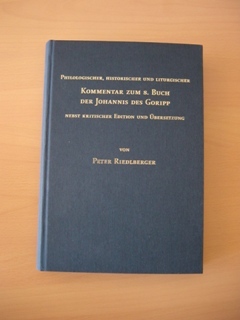 Most research on Gorippus was carried out either by philologists with a literary approach, who compared scenes in Gorippus with earlier models, providing intricate interpretations to perceived differences, or by text critics (as there is just one single—and sloppily written—manuscript of the Iohannis, this poem is a perfect playground for ingenious conjectures). Those few historians who were interested in Gorippus usually concentrated on the information he provides on the Berber natives. My original intention was modest and limited to creating a commentary on one specific book of the Iohannis. However, I quickly realized that the common opinion on the poet and his work needed rectification in many respects. What was originally intended as a short summary of available research on Gorippus and the Iohannis grew into a 100+ page handbook-like introduction that diverged substantially from what was believed to be a secure state of knowledge. I showed that the name “Corippus” is wrong and "Gorippus" instead has to be retained. Most details about him to be found in lexicon articles (“schoolteacher,” “from the countryside” …) have little or no basis in the sources. More importantly, based on a meticulous analysis of Gorippus’ language, I demonstrated that his linguistic idiosyncrasies—far from vulgarisms—are instead highly original intentional innovations. By pointing to obvious contradictions, I questioned the traditional methodology of comparing scenes in Gorippus with parallels scenes in Vergil and other previous authors and then giving ingenious interpretations regarding the differences in content; I proposed a different model according to which Gorippus used older texts as a quarry to quickly put his poem together. Using a radically new methodology, I created a new vision of the Iohannis’ purpose and circumstances of creation. A case in point: in the 8th book, there is a Byzantine officer named Putzintulus who performs deeds of valor. In the past, scholars wondered why Gorippus would invent so strange a name. Using prosopographical means, I was able to show this name is real, but its occurrence is limited to a tiny region in the Balkans, which however at the period was a preferred recruiting ground for the Byzantine army. Thanks to a detailed onomastical analysis, I detected many authentic, yet highly rare names (my favorite is Bulmitzis, a name otherwise attested only in Old Turkic, which a Byzantine soldier of “Hunnic” origin bore). In conclusion, my Iohannis was a great deal less “literary” and “incompetent” (in terms of language usage) and much more “historical” and “innovative” (again, as regards language) than it had appeared to earlier scholars. "Die Lektüre dieses ebenso klugen und gehaltvollen wie eloquenten und stilsicheren Buches ist von der ersten bis zur letzten Seite ein Genuß" (Silvio Bär, Gnomon). "El comentario ... es punto menos que definitivo. [...] Un trabajo memorable" (Luis Alberto de Cuenca, Emerita). "This is an outstandingly intelligent, thorough and well informed commentary" (Gregory Hays, Scripta Classica Israelica). "D’une impeccable présentation matérielle, d’une érudition à peu près irréprochable, d’une intelligence toujours en éveil" (Vincent Zarini, Latomus). "It will be an indispensable part of any future scholar’s required reading for research on North Africa of the period" (Betine van Zyl Smit, Acta Classica). "Der Kommentar ist einer der besten, die in den letzten Jahren zur spätantiken Epik abgefaßt wurden, eben weil Philologie und Historie gleichermaßen zu ihrem Recht kommen." (Rainer Jakobi, Hyperboreus).